Remember those days when doctors only had access to your body's information when you walked into their offices? Well, those days are over thanks to a new generation of body monitors that will broadcast your vital signs via every conceivable communication medium twenty-four hours per day, seven days per week. Consider Exmocare's BT2, the world's first Bluetooth vital signs wristwatch. The BT2 is the only wristwatch that can simultaneously, non-invasively, continuously and accurately detect with infrared and tiny metallic sensors from a fully moving wrist: heart rate, heart rate variability, skin temperature, skin conductance and relative movement. All-in-one design to monitor all critical vital signs 24/7 from the wrist with absolutely no cables, straps or electrodes. 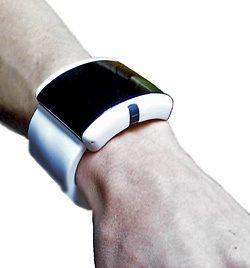 First ever Bluetooth biosensor wristwatch to send alerts via cell phone or internet. First ever wristwatch device to detect anxiety, depression and other emotional side effects of drugs. Online care giver account with up to 350 kinds of configuration for alerts by SMS, email or IM to guarantee no false alarms. Another system that is still in the clinical development stage is Raisin, a platform for body monitoring by Proteus Biomedical. Proteus has created ingestible event markers (IEMs) - tiny sensors that you can swallow that are activated by stomach fluids. 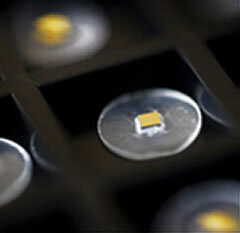 Each IEM taken with medication sends a digital signal to a wearable device that in turn relays information to your doctor. Proteus states on their website that the Raisin System is "improve the management of chronic diseases like heart failure, infectious disease and psychiatric disorders." As far as science-fictional precursors for these systems are concerned, I was thinking of Rudy Rucker's heartshirt from Wetware and the implanted microprocessor monitor from William Gibson's Neuromancer. [Mitsubishi-Genentech] employees above a certain level were implanted with advanced microprocessors that monitored mutagen levels in the bloodstream. Is this the ultimate healthcare resource, or a way for insurance companies to enforce compliance? Before you decide that doctors can never make mistakes, or that all healthcare is good healthcare, you need to carefully read Overtreated: Why Too Much Medicine Is Making Us Sicker And Poorer, an excellent book. Read more at the Proteus and bt2 Exmocare websites; see also Body 2.0 - Continuous Monitoring Of The Human Body for more info on similar technologies. Thanks to Moira for pointing me to the Body 2.0 article; any editorializing in this post is mine. I also wish my friends at frolix_8 would tell me the phildickian take on this, since I'm sure he must have had one.